Iran's Supreme Leader has approved co-operation with the US as part of the fight against Islamic State (IS) in Iraq, sources have told BBC Persian. However, Iran's foreign ministry officially denied it would co-operate with the US against IS. Ministry spokeswoman Marziyeh Afkham told Iran's Press TV the report was not correct. A further indication that Iran may have approved co-operation with the US comes from CNN's Christiane Amanpour, who tweeted that Iraqi President Fuad Masum had told her as much on Thursday. This new-found cooperation with US forces indicates a change in Iran's policy in Iraq, albeit one borne out of necessity. In 2001, Iran cooperated with the US in Afghanistan by arming and supporting the Northern Alliance which eventually overthrew the Taliban government. Now, there is a similar need to stop a threat, which Iran by itself can only defeat by bringing in thousands of troops. Defeating Islamic State will remove the threat on Iran's western borders and help stabilise Iran's two main allies in the region, Iraq and Syria. Iran can also avoid large numbers of boots on the ground, as long as Iraqi Shia militias, loyal to Iran's Ayatollah Khamenei, stand ready to take up the banner and fight. Iran's change of heart will no doubt be welcomed in Washington and London, where a joint strategy is taking shape towards creating a broad alliance of international and regional players to deal with the IS threat. Sources say Ayatollah Khamenei has sanctioned Gen Qasem Soleimani, the commander of the Quds Force - an elite overseas unit of the Revolutionary Guards - to work with forces fighting IS, including the US. Gen Soleimani has been active in the past few months in strengthening the defences of Baghdad with the help of Iraqi Shia militias. His picture has appeared on the internet showing him in northern Iraq around the time of the breaking of the siege of Amerli - an indication that this co-operation may have already started. Meanwhile, Nato leaders meeting at a summit in Wales say they want to form a military coalition to take on IS. "We need to attack them in ways that prevent them from taking over territory, to bolster the Iraqi security forces and others in the region who are prepared to take them on, without committing troops of our own," Reuters news agency quotes US Secretary of State John Kerry as saying. "Obviously I think that's a red line for everybody here: No boots on the ground," he said. 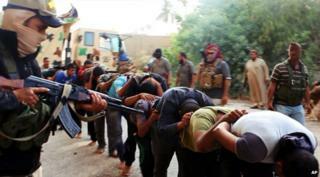 The brutality of IS - including mass killings and abductions of members of religious and ethnic minorities, as well as the beheadings of soldiers and journalists - has sparked outrage across the world. Last month Iraqi and Kurdish forces pushed IS back from parts of northern Iraq, but the group still controls what it has declared as a caliphate stretching across Syria and Iraq. Since the Islamic revolution in 1979, the US and Iran have had a fraught relationship. Washington severed ties the following year after Iranian students occupied the US embassy in Tehran and took 52 Americans hostage.